The weather patterns on Mars are rather fascinating, owing to their particular similarities and differences with those of Earth. For one, the Red Planet experiences dust storms that are not dissimilar to storms that happen regularly here on Earth. Due to the lower atmospheric pressure, these storms are much less powerful than hurricanes on Earth, but can grow so large that they cover half the planet. Recently, the ESA’s Mars Express orbiter captured images of the towering cloud front of a dust storm located close to Mars’ northern polar region. This storm, which began in April 2018, took place in the region known as Utopia Planitia, close to the ice cap at the Martian North Pole. It is one of several that have been observed on Mars in recent months, one which is the most severe to take place in years. The images (shown above and below) were created using data acquired by the Mars Express‘ High Resolution Stereo Camera (HRSC). The camera system is operated by the German Aerospace Center (DLR), and managed to capture images of this storm front – which would prove to be the harbinger of the Martian storm season – on April 3rd, 2018, during its 18,039th orbit of Mars. This storm was one of several small-scale dust storms that have been observered in recent months on Mars. A much larger storm emerged further southwest in the Arabia Terra region, which began in May of 2018 and developed into a planet-wide dust storm within several weeks. Dust storms occur on Mars when the southern hemisphere experiences summer, which coincides with the planet being closer to the Sun in its elliptical orbit. Due to increased temperatures, dust particles are lifted higher into the atmosphere, creating more wind. The resulting wind kicks up yet more dust, creating a feedback loop that NASA scientists are still trying to understand. Since the southern polar region is pointed towards the Sun in the summer, carbon dioxide frozen in the polar cap evaporates. This has the effect of thickening the atmosphere and increases surface pressure, which enhances the storms by helping to suspend dust particles in the air. Though they are common and can begin suddenly, Martian dust storms typically stay localized and last only a few weeks. While local and regional dust storms are frequent, only a few of them develop into global phenomena. These storms only occur every three to four Martian years (the equivalent of approximately 6 to 8 Earth years) and can persist for several months. Such storms have been viewed many times in the past by missions like Mariner 9 (1971), Viking I (1971) and the Mars Global Surveyor (2001). In 2007, a large storm covered the planet and darkened the skies over where the Opportunity rover was stationed – which led to two weeks of minimal operations and no communications. The most recent storm, which began back in May, has been less intense, but managed to create a state of perpetual night over Opportunity’s location in Perseverance Valley. As a result, the Opportunity team placed the rover into hibernation mode and shut down communications in June 2018. Meanwhile, NASA’s Curiosity rover continues to explore the surface of Mars, thanks to its radioisotope thermoelectric generator (RTG), which does not rely on solar panels. By autumn, scientists expect the dust storm will weaken significantly, and are confident Opportunity will survive. According to NASA, the dust storm will also not affect the landing of the InSight Lander, which is scheduled to take place on November 26th, 2018. In the meantime, this storm is being monitored by all five active ESA and NASA spacecraft around Mars, which includes the 2001 Mars Odyssey, the Mars Reconnaissance Orbiter, the Mars Atmosphere and Volatile EvolutioN (MAVEN), the Mars Express, and the Exomars Trace Gas Orbiter. Understanding how global storms form and evolve on Mars will be critical for future solar-powered missions. It will also come in handy when crewed missions are conducted to the planet, not to mention space tourism and colonization! Welcome back to our planetary weather series! Today, we take a look at Earth’s neighbor and possible “backup location” for humanity someday – Mars! Mars is often referred to as “Earth’s Twin”, due to the similarities it has with our planet. They are both terrestrial planets, both have polar ice caps, and (at one time) both had viable atmospheres and liquid water on their surfaces. But beyond that, the two are quite different. And when it comes to their atmospheres and climates, Mars stands apart from Earth in some rather profound ways. For instance, when it comes to the weather on Mars, the forecast is usually quite dramatic. 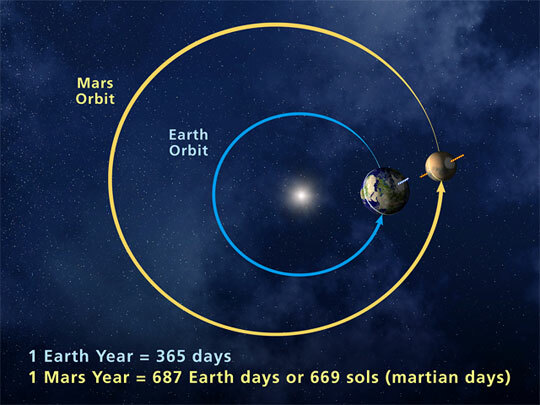 Not only does Martian weather vary from day to day, it sometimes varies from hour to hour. That seems a bit unusual for a planet that has an atmosphere that is only 1% as dense as the Earth’s. And yet, Mars manages to really up the ante when it comes to extreme weather and meteorological phenomena. Mars has a very thin atmosphere which is composed of 96% carbon dioxide, 1.93% argon and 1.89% nitrogen, along with traces of oxygen and water. The atmosphere is quite dusty, containing particulates that measure 1.5 micrometers in diameter, which is what gives the Martian sky its tawny color when seen from the surface. Mars’ atmospheric pressure ranges from 0.4 to 0.87 kPa, which is the equivalent of about 1% of Earth’s at sea level. Because of this thin atmosphere, and its greater distance from the Sun, the surface temperature of Mars is much colder than what we experience here on Earth. The planet’s average temperature is -63 °C (-82 °F), with a low of -143 °C (-226 °F) during the winter at the poles, and a high of 35 °C (95 °F) during summer and midday at the equator. Due to the extreme lows in temperature at the poles, 25-30% of the carbon dioxide in the atmosphere freezes and becomes dry ice that is deposited on the surface. While the polar ice caps are predominantly water, the Martian North Pole has a layer of dry ice measuring one meter thick in winter, while the South Pole is covered by a permanent layer that is eight meters deep. Trace amounts of methane and ammonia have also been detected in the Martian atmosphere. In the case of the former, it has an estimated concentration of about 30 parts per billion (ppb), though the Curiosity rover detected a “tenfold spike” on December 16th, 2014. This detection was likely localized, and the source remains a mystery. Similarly, the source of ammonia is unclear, though volcanic activity has been suggested as a possibility. Mars is also famous for its intense dust storms, which can range from small tornadoes to planet-wide phenomena. Instances of the latter coincide with dust being blown into the atmosphere, causing it to be heated up from the Sun. The warmer dust-filled air rises and the winds get stronger, creating storms that can measure up to thousands of kilometers in width and last for months at a time. When they get this large, they can actually block most of the surface from view. Due to its thin atmosphere, low temperatures and lack of a magnetosphere, liquid precipitation (i.e. rain) does not take place on Mars. Basically, solar radiation would cause any liquid water in the atmosphere to disassociate into hydrogen and oxygen. And because of the cold and thin atmosphere, there is simply not enough liquid water on the surface to maintain a water cycle. Occasionally, however, thin clouds do form in the atmosphere and precipitation falls in the form of snow. This consists primarily of carbon dioxide snow, which has been observed in the polar regions. However, small traces of frozen clouds carrying water have also been observed in Mars’ upper atmosphere in the past, producing snow that is restricted to high altitudes. One such instance was observed on September 29th, 2008, when the Phoenix lander took pictures of snow falling from clouds that were 4 km (2.5 mi) above its landing site near the Heimdal Crater. However, data collected from the lander indicated that the precipitation vaporized before it could reach the ground. Auroras have also been detected on Mars, which are also the result of interaction between magnetic fields and solar radiation. While Mars has little magnetosphere to speak of, scientists determined that aurorae observed in the past corresponded to an area where the strongest magnetic field is localized on the planet. This was concluded by analyzing a map of crustal magnetic anomalies compiled with data from Mars Global Surveyor. A notable example is the one that took place on August 14th, 2004, and which was spotted by the SPICAM instrument aboard the Mars Express. This aurora was located in the skies above Terra Cimmeria – at geographic coordinates 177° East, 52° South – and was estimated to be quite sizable, measuring 30 km across and 8 km high (18.5 miles across and 5 miles high). To date, Mars’ atmosphere, climate and weather patterns have been studied by dozens of orbiters, landers, and rovers, consisting of missions by NASA, Roscomos, as well as the European Space Agency and Indian federal space program. These include the Mariner 4 probe, which conducted the first flyby of Mars – a two-day operation that took place between July 14th and 15th, 1965. The crude data it obtained was expanded on by the later later Mariner 6 and 7 missions (which conducted flybys in 1969). This was followed by the Viking 1 and 2 missions, which reached Mars in 1976 and became the first spacecraft to land on the planet and send back images of the surfaces. Since the turn of the century, six orbiters have been placed in orbit around Mars to gather information on its atmosphere – 2001 Mars Odyssey, Mars Express, Mars Reconnaissance Orbiter, MAVEN, Mars Orbiter Mission and ExoMars Trace Gas Orbiter. These have been complimented by rover and lander missions like Pheonix, Spirit and Opportunity, and Curiosity. In the future, several additional missions are scheduled to reach the Red Planet, which are expected to teach us even more about its atmosphere, climate and weather patterns. What we find will reveal much about the planet’s deep past, its present condition, and perhaps even help us to build a future there. We have written many interesting articles about Martian weather here at Universe Today. Here’s Mars Compared to Earth, It Only Happens on Mars: Carbon Dioxide Snow is Falling on the Red Planet, Snow is Falling from Martian Clouds, Surprise! Mars has Auroras Too! and NASA’s MAVEN Orbiter Discovers Solar Wind Stripped Away Mars Atmosphere Causing Radical Transformation. For more information, check out this NASA article about how space weather affects Mars. Good news for the spacecraft sitting on or orbiting Mars: a dust storm on the Red Planet that looked as though it could spread around the entire planet now appears to be abating rather than going global, NASA says. “During the past week, the regional storm weakened and contracted significantly,” said Bruce Cantor of Malin Space Science Systems, San Diego. Cantor uses the Mars Color Imager camera on NASA’s Mars Reconnaissance Orbiter to monitor storms on the Red Planet. Recent images and data from the Environmental Monitoring Station (REMS) on the Curiosity rover have also shown a hazy atmosphere and air pressure changes in the vicinity of Gale Crater. Part of gigantic panorama from Curiosity, showing an increasingly hazy view off in the distance, likely because of a dust storm. Credit: NASA/JPL/MSS, with image editing by Stuart Atkinson. See the full panorama here. “We are getting lots of good data about this storm,” said Mark Richardson of Ashima Research, Pasadena, California, a co-investigator both on REMS and on the Mars Reconnaissance Orbiter’s Mars Climate Sounder instrument, which has been detecting widespread effects of the current storm on atmospheric temperatures. Researchers anticipate that the unprecedented combination of a near-equatorial weather station at ground level, and daily orbital observations during Mars’ dust-storm season, may provide information about why some dust storms grow larger than others. This is good information to have for any potential future human visitors to Mars. Thanks to the work of David Choi, a postdoc at NASA’s Goddard Space Flight Center in Greenbelt, Maryland, we’re now able to reasonably record wind speeds through the use of high resolution images taken from HiRISE onboard the Mars Reconnaissance Orbiter. When lucky, the camera captures the storms as a “work in progress” – detailing small features. By pinpointing these signature marks, Choi was able to determine the wind speeds by knowing the timing between frames. According to the news release, the winds are traveling at about 45 meters each second — what we Earthlings would consider “hurricane-force,” or above 33 meters per second. However, at other times the winds would slow to between 20 and 30 meters per second. 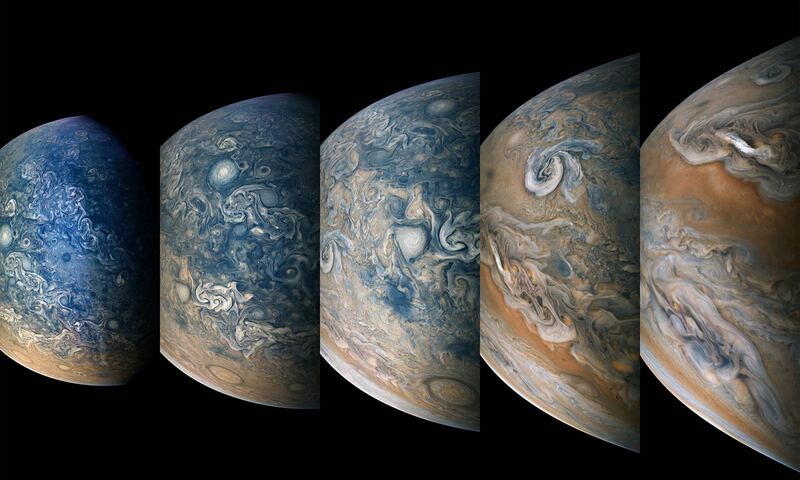 These new findings were then compiled and Choi presented his results October 3 in Nantes, France, at the joint meeting of the European Planetary Science Congress and the American Astronomical Society’s Division for Planetary Sciences. “As a whole, they’re not like a hurricane, but there are pockets or gusts that exceed hurricane-force,” Choi says.